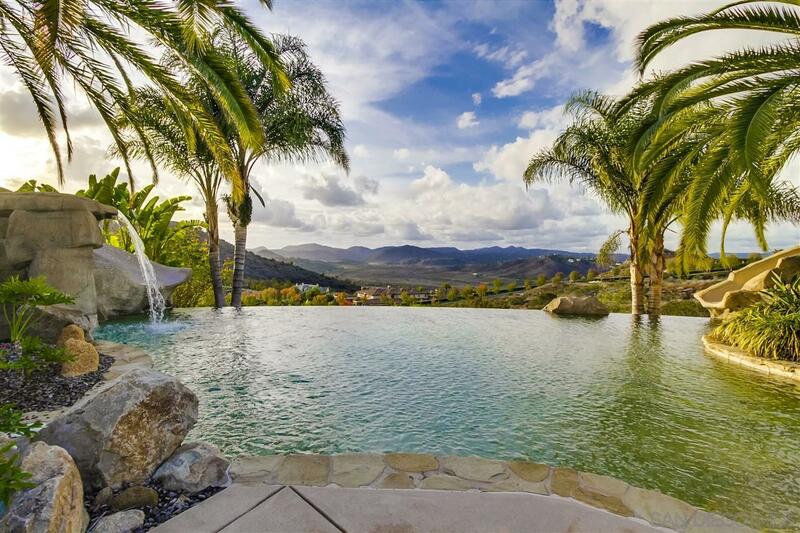 Incredible views at this privately gated single level home! Seamless indoor/outdoor living and masterfully designed floorplan with a spacious master suite plus three secondary bedrooms on one side plus a private guest suite on the other. Private lighted tennis court, resort style pool w/ 2 water slides, waterfalls & spa. 1100 sq ft loggia with built in BBQ is perfect for entertaining. Executive office that opens to an interior courtyard, home theater, game room, sauna & bonus room near secondary rooms., Ideal indoor outdoor living, stunning views and complete privacy on a premier culdesac location! This residence is built around an entry courtyard with an outdoor fireplace and on a large lot in Poways exclusive neighborhood known as "The Heritage." Featuring 5 BR suites, an impressive wood paneled office that opens to the interior courtyard, a private home theater, game room, gourmet kitchen with a massive center island and generously sized family room featuring a wood beamed ceiling, custom built ins & stone fireplace. The sliding glass doors in the family room and informal dining area open to the 1100 square foot outdoor loggia and built in BBQ creating the ultimate in luxurious yet comfortable living. Play a game of tennis on your own private lighted court or relax poolside where you'll be captivated by the stunning vistas. Award winning Poway schools...this is the ultimate Southern California dream home!